My apologies that I was MIA on the blog for the month of February. I decided to take a business course and although it has been extremely helpful, it has been like having a third child, a newborn at that! It required much attention and even caused me to lose some sleep at night. Since hitting the “send” button and submitting the final report, I can now go back to paying attention to my two real children and husband ... and maybe even myself a bit. Many of my close friends asked me this month how I was managing to do it all – take a course, run a business, be a mom etc. etc. My answer, the real honest truth, is that it wasn’t always pretty. Meals weren’t always thoughtful, toys and games were left all over the house in the morning, children’s mitts went missing and I’ve even managed to lose my security card to my new office ALREADY! Through the craziness, what helped me the most was focusing on grace. Giving myself grace to feed my children a box of Annie’s Mac and Cheese, giving myself grace to have a dirty house (as much as it bothers me), giving myself grace to accept help from a tender-hearted mother or generous sister-in-law, and giving myself grace to know that I don’t need to be perfect. And in the end, I know that God's grace is a gift and I am so lucky to be able to receive that gift every day. When you’re busy, as I know we all are, the key to eating well is planning. Doing things in advance like making breakfast and packing lunches the night before, helps me stay on track, especially when mornings in our house run like an episode of Paw Patrol, where there is always someone that needs immediate attention and help! Fibre + Protein = Match Made in Heaven! This rockstar of a breakfast boasts around 10 grams of fibre and 16 grams protein per serving, making it check off all the boxes of a breakfast that will "stick to your ribs" all morning. 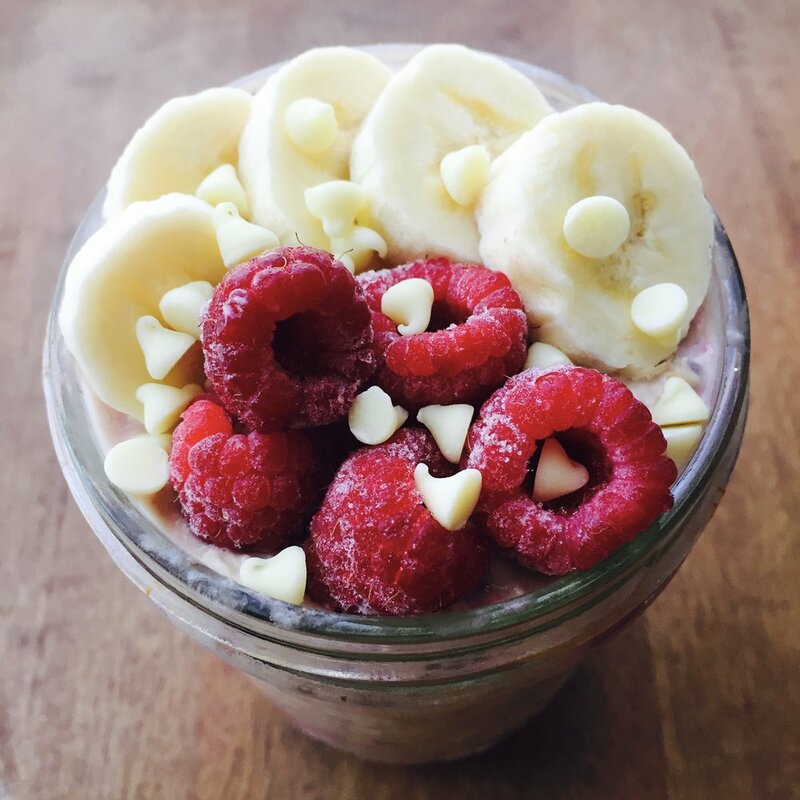 Overnight oats is a practical breakfast, especially for any shift workers or commuters: make the night before and grab the jar in the morning. This way you can save your hard earned cash and avoid the drive through on the way to work. Don't forget that you need not restrict this meal for breakfast - it is a great lunch (or even supper) too! In a small to medium-sized bowl, mash the banana with a fork. Add the rest of the ingredients to the bowl and stir. Divide evenly into two wide mouth glass jars (or 3 jam-sized jars) and set in the fridge overnight. Simply grab and go in the morning OR add toppings of your choice prior to serving (see note below). 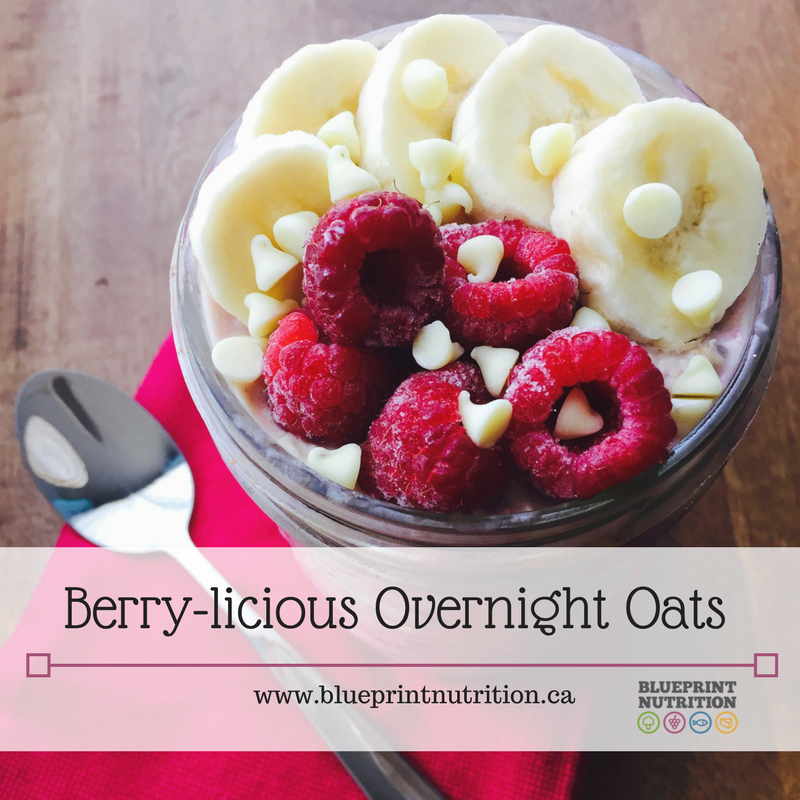 Many recipes use fresh fruit, and while that is tasty when fruit is in season, I typically use frozen berries for my overnight oats. In case you didn’t know, frozen berries are very high in nutrients (more so than the cardboard strawberries shipped in from California or Mexico in the winter here in Canada), and cost less than fresh fruit. I used frozen raspberries in this batch but you can use any fruit or combinations of fruit that you like.